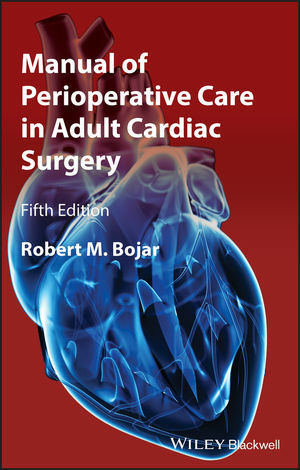 The fifth edition of Bojar's Manual of Perioperative Care in Adult Cardiac Surgery remains the gold standard for management of adult patients undergoing cardiac surgery. The easily referenced outline format allows health practitioners of all levels to understand and apply basic concepts to patient care--perfect for cardiothoracic and general surgery residents, physician assistants, nurse practitioners, cardiologists, medical students, and critical care nurses involved in the care of both routine and complex cardiac surgery patients. Updated references, information on new drug indications and new evidence to support various treatment/management options. Practical and accessible, this new edition of Manual of Perioperative Care in Adult Cardiac Surgery is the essential reference guide to cardiac surgical patient care. Dr. Robert Bojar, Associate Professor of Cardiothoracic Surgery, Tufts University School of Medicine; Chief of Cardiothoracic Surgery, St. Vincent's Hospital, Worcester, MA; Senior Cardiothoracic Surgeon, Tufts-New England Medical Center, Boston, MA.